Ahead of UFC 236 this weekend, the fighters who will be headlining the biggest cards throughout the summer made a special appearance in Atlanta for a press conference to preview what lies ahead in 2019. Several champions and former champions decorated the dais, with a huge slate of fights scheduled between now and July, culminating in International Fight Week, which is capped off by UFC 239. Unfortunately, light heavyweight champion Jon Jones was under the weather so he was unable to make an appearance, but his opponent, Thiago Santos, was more than happy to offer a bold prediction about their upcoming fight in July. “I’m very excited for the fight. I will shock the world,” Santos promised. Check out the highlights from the UFC's seasonal press conference. 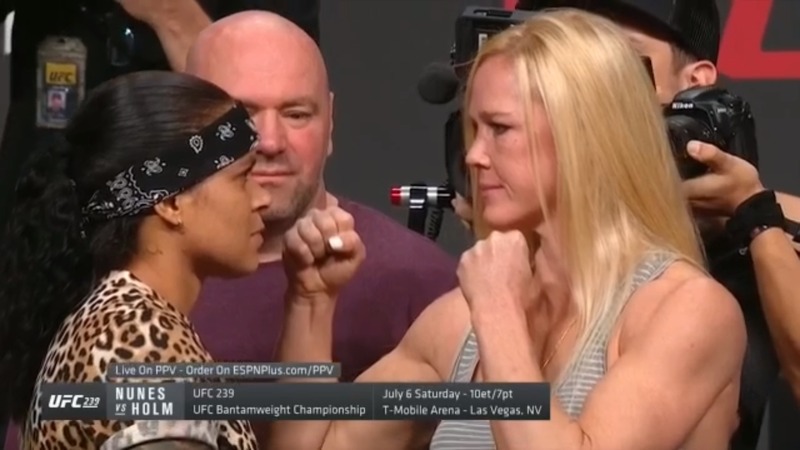 In the co-main event at UFC 239, two-division champion Amanda Nunes will put her bantamweight title on the line against Holly Holm, who will also be returning to 135 pounds after previously competing at featherweight. Nunes has already been touted as arguably the greatest women’s fighter of all-time thanks to wins over UFC Hall of Famer Ronda Rousey, Miesha Tate and Cris Cyborg, but adding Holm to her resume would almost assuredly cement her place as the best ever. The first time Holm competed for the title back in 2015, she was a decided underdog going up against Rousey at UFC 193. That’s when she landed the knockout heard ‘round the world to become the bantamweight champion. Check out the faceoffs from the UFC's seasonal press conference. Holm doesn’t want to necessarily compare the two situations because they’re not the same, but she enjoys playing the role of underdog in marquee fights such as this one. “As far as being the underdog, a lot of people ask me about that, if it fuels me to be the underdog, and it does,” Holm explained. “Not because I’m technically trying to prove everybody wrong but it’s that challenge for me. Two more marquee fights are also scheduled for UFC 239 when Ben Askren faces off with Jorge Masvidal at welterweight while former champion Junior dos Santos looks to keep his win streak alive against power punching heavyweight Francis Ngannou. Askren didn’t have a verbal sparring partner on stage with him on Friday because Masvidal had a prior commitment and couldn’t make it to the press conference. That certainly didn’t stop the 2008 Olympian from sending a message to Masvidal, who will undoubtedly hear about this one soon enough. “Jorge needs to know, I don’t get full on a three piece and a soda. He better bring the whole damn family meal for that night,” Askren said with a smirk. Meanwhile, Ngannou and Dos Santos both know what’s on the line in their fight, as the winner will be knocking on the door to title contention. Originally, Dos Santos had planned on taking some of the summer off to spend with his family, but when the call came with an offer to face Ngannou, he couldn’t resist. “We cannot miss a good opportunity,” Dos Santos said. “This fight should have happened in the past, it’s happening now. I’m happy to be fighting this guy. Everybody is talking about him, about his power. For me, that’s the challenge I’m looking for. Before International Fight Week gets here, the UFC will return to Florida in just two weeks time for a middleweight showdown, as perennial contender Ronaldo “Jacare” Souza will take on late notice replacement Jack Hermansson in the main event. Souza was originally expected to face Yoel Romero, but the former two-time title contender fell ill and he was forced out of the contest. Souza hopes that the stakes for the fight will still be the same, however, as he expects to earn a title shot with a win on April 27. Riding a three-fight win streak into the main event, Hermansson knows this is a huge opportunity facing a top five opponent like Souza, even if it came together on short notice. Thankfully, the Swedish born middleweight showed in his last victory against David Branch in late March that he’s always up for a challenge. “I’m super excited for this fight and I’m looking forward to making the most out of it,” Hermansson said. On May 11, the UFC will return to Brazil with a blockbuster UFC 237 card headlined by strawweight champion Rose Namajunas putting her belt up for grabs against human wrecking ball Jessica Andrade. Andrade earned this opportunity with three straight wins, including a knockout against former title contender Karolina Kowalkiewicz in her last fight. Admittedly, Andrade was taken back when she learned that she was getting the title shot in her native Brazil, but she certainly appreciates Namajunas’ willingness to step into enemy territory for this fight. “I was very surprised that I got the offer to be able to fight in Brazil. It’s been three years since I fought in Brazil and I was more surprised that Rose gave me the opportunity to be able to do this,” Andrade said. “I hope she’s very well treated in Brazil. For her part, Namajunas just looks at this as business as usual and she’s not adding any extra stress onto her latest title defense by spending much time focusing on fighting in Brazil. In fact, Namajunas plans on treating this like any other fight week in the UFC. One week later, the UFC will land in Rochester, NY for the first time in history with a welterweight main event pitting Rafael Dos Anjos against Kevin Lee. This will be the first foray into welterweight for Lee, who was previously a top five-ranked lightweight. Lee has long contemplated a move up to 170 pounds and he’s happy for the chance to be completely healthy and happy going into a fight of this magnitude. “The timing just seemed right for it,” Lee said about his move to welterweight. “You see a lot of other guys moving up and having more success. Dos Anjos seemed more than happy to welcome Lee to the division as he looks to continue his climb back into title contention. Two former light heavyweight title challengers will then clash on June 1 when the UFC returns to Stockholm, Sweden with local favorite Alexander Gustafsson taking on Anthony Smith. It’s a quick turnaround for Smith, who just faced Jon Jones in early March, but he wasted no time booking his next fight when the chance to face Gustafsson was offered to him. “Things are going well. I’m still sharp. I’m still feeling good. I’m ready to get my spot back,” Smith said. The chance to fight at home is always important for Gustafsson, who always enjoys the fervor of a boisterous crowd whenever he competes in his native Sweden. This is also a huge moment for Gustafsson in his career after falling to Jones last December, as he came up short in his third bid to win the light heavyweight title. From there, the momentum will shift to Chicago for UFC 238, where a new bantamweight champion will be crowned on June 8 as flyweight king Henry Cejudo moves up to 135 pounds to take on ferocious knockout artist Marlon Moraes. 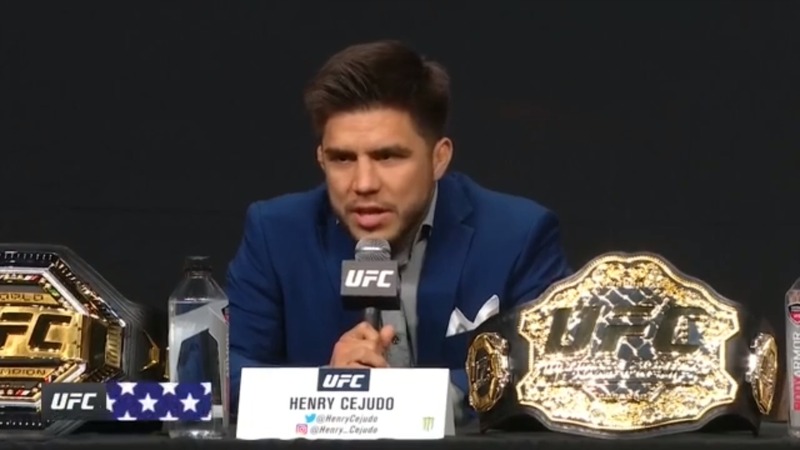 Cejudo, who already touts the flyweight title and a 2008 Olympic gold medal, was already starting to make room for more gold while sitting just a few feet away from his future opponent. Moraes wasn’t rattled by his opponent’s words and instead he just offered up a chilling promise when responding to Cejudo. The month of June will then close out on June 29 with a rematch between two former welterweight champions, as Tyron Woodley meets Robbie Lawler in the main event of UFC Fight Night in Minnesota. Woodley was anxious to get back to another title shot after falling to new champion Kamaru Usman in March, and that’s why he was more than happy to face Lawler for a second time. The fight serves as a shot at redemption for Lawler, who was knocked out by Woodley in the first round when they met back in 2016. Stoic as ever, Lawler didn’t feed too much into the idea of revenge, but rather just another opportunity to do what he loves most.